The future of older people's rehabilitation services on the Fylde Coast. Your views on the Proposals are very important which can be made in several ways as detailed in the above web site. 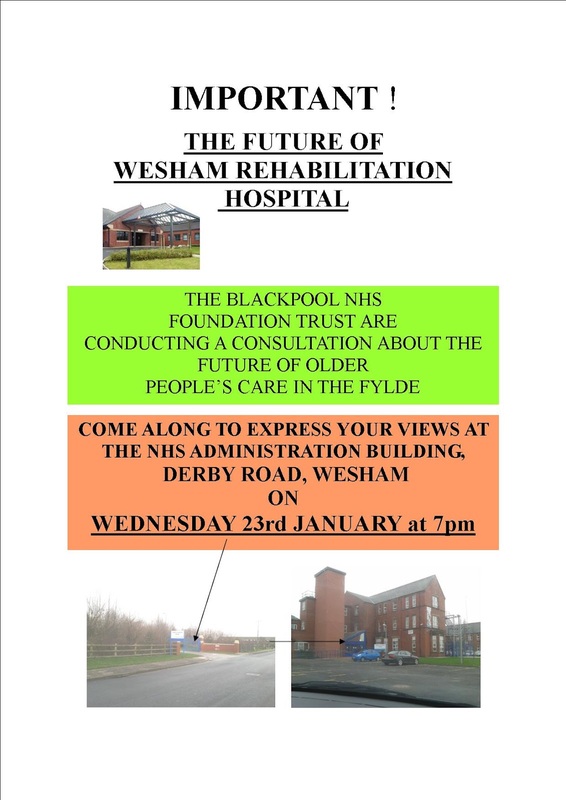 An additional Public Meeting has been arranged in Wesham in the 'GRASMERE ROOM' at The Primary Care Trust Administration Building, Derby Road, Wesham on WEDNESDAY 23rd January at 7pm. Extensive parking will be available and directions from the car park to the Grasmere Room will be in place. 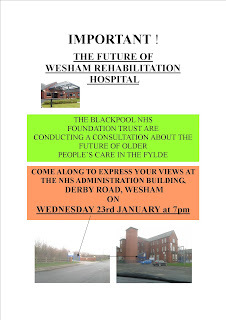 Please come along to let the Blackpool Teaching Hospitals Foundation Trust know your views. From the centre of the Town at the War Memorial, proceed towards Kirkham . After the garage (Kirkham Tyres) on your left, bear left at the mini roundabout, turn left into Derby Road. Continue down and the car park is the second turning on your left.